He cleans up well! Like him in both looks! Yummy! Love this guy’s sense of style. He owns some pretty cool shoes. This guy has the fullest energy my god !!! His battery is always charged .. saw sonams vdo and he’s so so so entertaining. Loved him man ! He looks crisp. Like both of those outfits, the krishna pose- not so much ! The wedding look is so polished and cute! The glasses add some perfect drama. The jacked in the second look is ugly. Baba is always hot. End of discussion. Love the wedding look! Classy! Love the footwear he’s paired with the kurta. 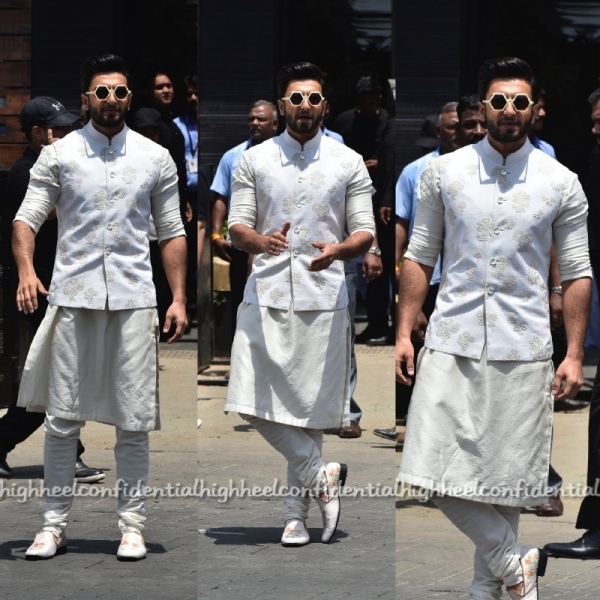 And those glasses – trust Ranveer to add the quirky touch! the smile, the look, the outfits… and oh my the attitude! this chap has it all! Definitely both. He looks great. What’s with the same rehearsed pose in both the looks? The only one who got it right among the men- Looking at you Arjun, Varun and Karan ! !